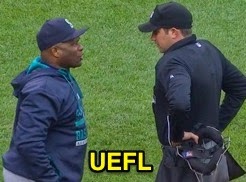 HP Umpire John Tumpane ejected Mariners 3B Kyle Seager for arguing a strike three call in the top of the 5th inning of the Mariners-Orioles game. With one out and one on, Seager took a 3-2 fastball from Orioles pitcher Brad Brach for a called third strike as catcher Ryan Lavarnway threw to shortstop JJ Hardy to retire Mariners baserunner R1 Robinson Cano. Replays indicate the pitch was located over the inner half of home plate and thigh high (px 0.530, pz 2.184 [sz_bot 1.410, sz_top 3.350]), the call was correct. At the time of the ejection, the Orioles were leading, 4-3. The Orioles ultimately won the contest, 5-4. This is John Tumpane (74)'s third ejection of 2015. John Tumpane now has 12 points in the UEFL Standings (7 Previous + 3 AAA + 2 Correct = 12). Crew Chief John Hirschbeck now has 8 points in Crew Division (7 Previous + 1 Correct Call = 8). This is the 53rd ejection of the 2015 MLB Regular Season. This is the 24th player ejection of 2015. Prior to ejection, Seager was 2-3 in the contest. This is the Mariners' 2nd ejection of 2015, T-1st in the AL West (OAK, SEA 2; HOU, LAA, TEX 1). This is Kyle Seager's first career MLB ejection. This is John Tumpane's first ejection since April 24, 2015 (Bruce Bochy; QOC = Y [Balls/Strikes]).